Independent Living – Coming Soon! Is living in a retirement community for you? We have interviewed several residents across the country at various Watermark communities. They will tell you in their own words why they decided to move and why you should consider it too. We hope by providing honest insight from people who were once in your shoes you will get the help you need to make one of the most important decisions of your life. Start planning your secure future today by honestly assessing your current situation and exploring all your options. 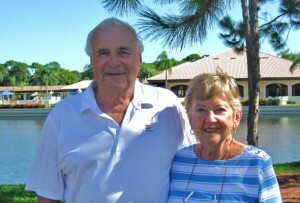 MEET TOM AND JOANNE GILDEA, WHO LOOKED FIVE PLACES BEFORE FALLING MADLY IN LOVE WITH THE FOUNTAINS AT LAKE POINTE WOODS. Pennsylvania natives, Tom and Joanne Gildea are among the newest neighbors to make The Fountains at Lake Pointe Woods home. Tom graduated from Villanova University in 1952 and Joanne graduated from Dickinson College in 1954. Tom served in the Marine Corps during the Korean War and went on to be a Commercial General Contractor. Joanne owned her own small antique business, she is an avid golfer and together they enjoy playing bridge. They have three children, seven grandchildren, one great-grandchild and three more great-grandchildren on the way. For the past ten years, they’ve spent the majority of their time in sunny Florida, content to visit their Pennsylvania relatives and friends in the summers.